A guest post by Jasmine Demeester. In this techno-centric world of today, there are tons of bloggers running a blog for the sake of passion and money. However, no-one is free from the wrath of internet trolls. This post is designed for beginners bloggers just starting to face the bitter world. No matter whether you are blogging for personal reasons or for business, internet trolls may prowl over you anytime and make your life a misery. Bloggers beware! Something more eldritch than ghouls and phantoms is crawling your way. What is it? Indeed, a troll it is! People often regard blogging as a brain-free job. “Even a monkey can do your job,” they say! It is hard to find anyone today who doesn't own a blog or doesn’t follow one. However, many may begin, but only a few succeed. What is the reason for this failure? Roadblocks! Beginners aren't paid to sit in front of a laptop screen all day long. Instead, they're paid to produce highly readable content. However, it's really tough to do this with internet trolls ruining both your blog and your day with their nasty comments. Trolls and trolling, what are these? In mythology, a troll is an angry mysterious monster who is hidden in dark, shady corners waiting to pounce on his prey. In other words, a troll lurks behind your computer screen to make nasty, divisive and disgusting comments anonymously to ruin your day and blog. “The deliberate act (by a Troll – noun or adjective) of making random unsolicited and controversial comments on various internet forums with the intent to provoke an emotional knee jerk reaction from unsuspecting readers to engage in a fight or argument." 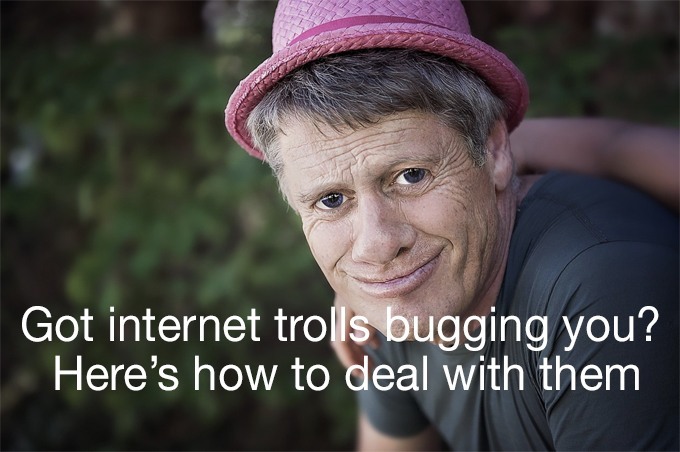 Trolling is a rapidly accelerating phenomenon haunting the internet. It can affect businesses massively. Trolls aim to spill controversies via unreasonable comments to evoke an emotional response from the victim. A troll's only purpose is to disrupt the flow of the business. They are enjoying some savage pleasure in giving rise to criticism, arguments and negative debates on public platforms. Establish a commenting system that clearly outlines the type of comments that are acceptable on your blog. If you have a community that handles your social platforms and comments, providing them with a commenting framework can protect your blog against repelling criticisms. Your commenting policy should elaborate on which sort of comments are allowed. Implementing such an active strategy will not completely clear it from these ghosts, but it will work to a significant extent to control them. If possible, moderate all comments before publishing them. This allows you to delete anything unsuitable and post only appropriate contributions. Hopefully this will send a message to your trolls their negativity doesn't have a free passage onto your blog. However, if you are lucky enough to receive many comments, moderation can be pretty exhausting. It is necessary, though, if your followers expect to see an instantaneous reaction to your comments. And may be appropriate if trolling has got beyond your control and is causing severe destruction. If you can find out their IP addresses, these can be added to the 'black list' area within the commenting settings. This will block them from commenting again on your blog. Or you can spam them so Akismet (or any other spam moderator) can prevent them from commenting on other blogs. How should I reply to trolling? Despite all your efforts to make your blog an entirely troll-free platform, you may not be successful. Nasty comments may still pop up, and it's totally impossible to ignore them. Here are some tricks to respond to these enemies. Once your blog starts to become successful, it will ultimately attract internet trolls. But hopefully this success has also resulted in a large community of readers, who have become your loyal fans! Yes, you heard right, fans! Successful bloggers have accrued a fellowship who are willing to defend them in a public argument. First, this provides a robust response to the troll with the minimum of effort. And second, it will increase your rating and drive more traffic to your blog. If your internet troll posts something that affects your credibility, it is not a good idea to engage emotionally. Use facts and figures to defend yourself adequately. This will easily shut him up and present your readers with an idea of your decency. However, if a troll highlights a fundamental mistake, it is best to acknowledge it publicly and make your correction. This will disappoint your enemy because his intent is to agitate you, but you turned the other way! Never get angry with a troll. That is what they aiming for. This will show you up in a bad light as you will never win an argument with a troll. You could say things you regret later, which could adversely affect your loyal readers. It could also have a negative affect on your career in the long-term. Trolls attempt to attack your comfort zone. In response, try looking at the funny side of their negative comments. In order to succeed, you have to rid yourself of life's negativities. Trolling is one of those. Try responding even to the cruelest comment with humour, or at least lightheartedness. Providing sufficient amusement can bring a positive response and more attention to your blog. It will encourage your readership community to discuss your feed publicly. The worst thing you can do for your blog is to feed your trolls. They seek any angry response so they can sit back and enjoy it. If you genuinely desire to avoid making a mess, never reply to them. Totally ignore them. An internet troll will keep trolling if he continues to be attracted by passionate replies. What's your response to internet trolls? Haters are everywhere, and it is impossible to get rid of them altogether. However, dealing with them is quite easy and even fun, if done the right way! A hater is not to be afraid of; instead they validate your value. Go through the tips and tricks mentioned above and learn how to enjoy these internet trolls trolling away on your blog. Jasmine Demeester recently graduated from a local college in Manchester and currently serves as a part of a recognised Dissertation Help Deal in the UK. Her keen writing skills have gained her versatility in writing about multiple topics. Jasmine soars her passion for blogging, where she shares her experiences with others.